The Traveling Workshops Program (TWP) brings national leaders in environmental, sustainability, and geoscience education to your campus, regional, or national event. The Traveling Workshops Program focuses on opportunities to strengthen both courses and programs including attracting and supporting diverse students. It brings together expertise from numerous NSF funded projects including the On the Cutting Edge, InTeGrate, SAGE, and GeoNeeds. The TWP is a part of NAGT's integrated Workshop Program. Strategies and approaches that have worked for others in the US and Canada. A collection of resources, including department best practices, curricula, courses, modules, and activities, on the topic(s) of their choice. A departmental, program, or individual action plan for moving forward. "I go into tomorrow with a renewed enthusiasm for making us a better department and to make us an integral part of the University and community." "Bringing the workshop to the department is a highly valuable vehicle for engaging the entire department, and I really can('t) say enough about this model. Kudos to the Building Strong Geoscience Program..."
Complete description of the steps that the department, program, or group needs to carry out to help the workshop leaders provide a successful workshop experience. Bios of faculty members and education specialists that lead traveling workshops. 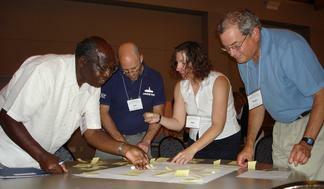 There are six workshop themes that host institutions can choose from. Please read through each of these themes and select the one that best fits your interests. Within each of these themes there are numerous sessions and topics that can be combined to produce a workshop that is the most beneficial to your department, program, or group. Determining which sessions and topics best fit your workshop will be coordinated between the host institution lead and the workshop leaders AFTER the workshop application has been selected. In addition, workshop themes can be combined if the host institution is interested in addressing course-level and department- or program-level issues. These programs are designed for departments, institutions, or groups of institutions linked by transfer programs or other shared interests. Sessions can be adapted for program leaders from multiple institutions. These full-day workshops are designed for groups of about 30 people and bring high quality teaching and learning workshops directly to departments, institutions, and regions. With a focus on improving teaching and learning, these workshops provide an ideal opportunity to learn about new pedagogies, re-energize old ones, and to spend time with colleagues reflecting on what we teach and how students learn. The workshops can be designed to emphasize material applicable beyond the geosciences, and can be combined with the Building Stronger Departments workshops described above. Please note that it can take 5-7 weeks to plan your workshop. Bear this in mind when deciding which application deadline to submit against.